Low pressure treatment of Moss, Algae & Lichens from all types of roofs. Over time roofs become colonised by Moss, Algae and Lichens. 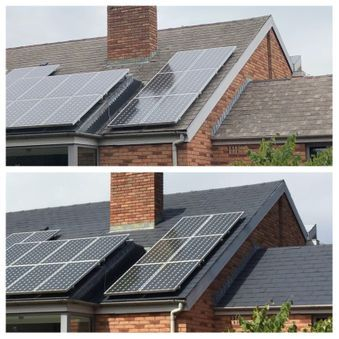 Other than just being unsightly, these contaminants can lead to issues such as leaks and premature ageing of the roof's materials. 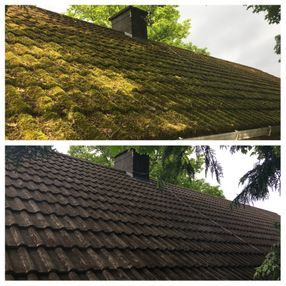 Moss can build up in valleys, behind chimneys, and in the joints of slates or tiles, acting like a dam during heavy downpours and causing leaks and dampness internally. Gutters and downpipes fill and block easily due to moss constantly falling or being picked at by birds. If you are here reading this then I'm sure you know all about the constant cleaning of drives and patios, especially during the summer months! 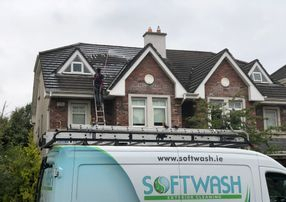 The First Rule of Roof Maintenance: Keep the roof clean and free from debris so water can drain quickly and surfaces dry faster..
Our soft wash approach to cleaning all types of roof materials can be described in four easy steps. Step one: The entire roof surface is checked for damage and any necessary repairs made. Step two: All, or up to 90% of the moss and other growths are removed by hand to prevent guttering and down pipes from future blockages. Step three: The entire roof surface is then treated using the specially developed AlgoClear® Pro Softclean formula to ensure any remaining spores die off and their reproductive cycle broken ensuring longevity of results. Step four: All guttering and fascia are cleaned and a full site clean up takes place. A period of weathering does the rest.. The speed of cleansing is by and large in relation to the site's exposure to the elements but after a short period of time the roofs initial intended appearance will begin to reappear. Introducing Chromaseal - A new pigmented roof sealer by TVSP Ltd.
Chromaseal is a one or two coats formula containing molecules so small they penetrate deeply and adhere to the support. Chromaseal is pigmented and highly hydrophobic. The coating is microporous, preserving the breathability of the material. For us on mineral materials: Concrete, Clay, Fibre cement & Asbestos. Available in a range of colours. 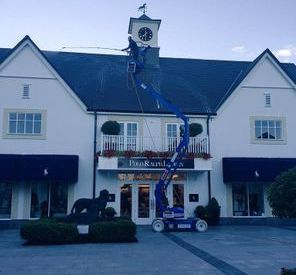 For more roof maintenance options including new roofs and repair advice visit our sister site HD Roofing Services.